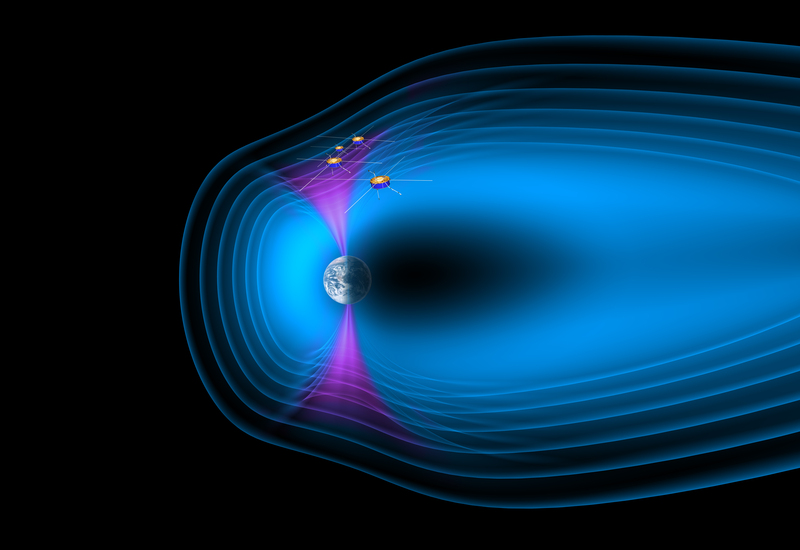 This illustration shows the magnetic environment of Earth, which arises from the interaction between the solar wind, a stream of electrically charged particles released by the Sun, and our planet's internal magnetic field. 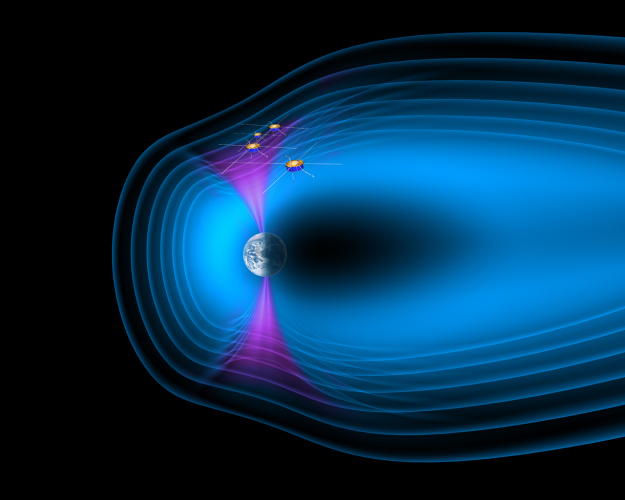 In fact, the magnetosphere acts as a shield that prevents most of the solar wind particles from infiltrating Earth's atmosphere. Highlighted in purple are the polar cusps, two regions above the planet's magnetic poles where the magnetic field is extremely weak. Through the cusps, particles from the solar wind can access the upper layer of Earth's atmosphere – the ionosphere – and thus sometimes perturb the propagation of signals through it, disturbing for instance the accuracy of GPS positioning. In the illustration, the four spacecraft of ESA's Cluster mission are shown as they fly from the magnetosphere into the northern cusp, in the configuration they had on 14 February 2003. This was a very favourable crossing event to study the properties of high-energy particles in the cusp. Using data from this event, scientists have inferred that the particles are accelerated locally, within the cusp, as they cross regions characterised by different electric potential – a configuration shown to result from magnetic reconnection events for this case study.